Question: What does it mean to perceive what is external to you? Answer: Our desire is actually neutral. It can be used for your own benefit or for the benefit of others. It all depends on what a person wants: to bestow or to receive. 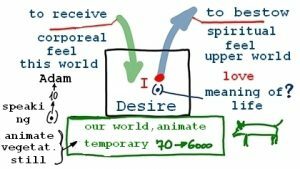 If I want to receive, the desire is called a corporeal desire and I feel this world; if I want to bestow, to give, the desire is called a spiritual desire, and then I feel that I am in the upper world. The point is that anyone can receive, but you need to know how to be able to bestow. “Kabbalah,” although this translates to “receive” in Hebrew, it is actually the science of bestowal. Therefore, it is built on the quality of bestowal and its main law is love. Love is filling the desires of other people, which unfortunately does not exist in our world. Most importantly, if I can bestow unto someone, I can help him attain the upper world. In other words, our bestowal to the world comes down to disseminating this method, because it is only by this method that a person can reach a comfortable, true, eternal, and perfect state. Question: What gives a person the feeling and attainment of the complete picture of the world that surrounds us? How does it change his life and his fate? Answer: How would you perceive your life if you knew which of your actions have a good impact and which have a bad impact on the whole world, if you had the perspective of everything that is in our life, even infinite years ahead, as if time did not exist, and if you were in a continuous developmental process feeling what is beneficial for this development and what is harmful, how would this feeling affect you? You would suddenly discover that it is an interesting interaction, a symbiosis, the connection of your corporeal and spiritual parts, which impact each other with such incredible interdependence that with can make amazing discoveries and attain such achievements and heights that are quite difficult to achieve outside the corporeal body. The wisdom of Kabbalah gives us this opportunity to use here in this world. Therefore, act now because you will be in the upper world forever since time does not exist there. Question from Facebook: I have been betrayed many times in life. I know what it is, but I still want to ask, what is betrayal? Answer: I have also often felt a change in attitude toward me that could be called betrayal. But since I began to study the wisdom of Kabbalah, I have always accepted it as completely natural, without any internal drama, without anger or grumbling, without a desire for revenge, because first of all, that is how human nature is manifested. Second, this doesn’t reveal the person who betrayed you, but the Creator who is showing you how much your attitude has not been perfect, far from total love, loyalty, and complete interaction with others. So your resentment and grumbling is out of place. On the contrary, you need to understand that if you want to attain absolute devotion in your relationships with others, you must ascend in spiritual levels to a state where your ego will be completely subordinated to the law of brotherhood and love. This is a high level but attainable. Only to the degree that you rise to a level of shared work with a friend, will you be able to trust him as yourself. And there is no place for betrayal there because during an ascent you enter into an area where you are protected by the Upper Light. A higher energy illuminates you so that you are not able to carry out anything improper because you are under its influence. What is our character, what is its purpose, is it possible to change it, and what is the way to realize it in order to reach connection through integral education? There are four basic character types and each one of them is then divided into four. Overall there are 16 basic character types. Each person is composed of many gears and each cogwheel needs to conform to roll with others. Mankind needs to reach completion between these four prototypes to be as one whole person. People are always looking for people to complement them, they are looking for a perfect connection with the environment. Balance and mutual completion means that we all are both different and equal. Everyone wants overall completion, even the sad types. For example, in the past there were leaders with “the look of melancholy.” What defines a person’s character is both fate and genetics. You can call it Reshimo (Reminiscence). There are four internal character layers: a. the hidden layer, b. the known and undesirable, c. the desired, and d. the outer presentation. The integral approach doesn’t work on individual psychology, but on the development of human connection. Nature created us differently so we would realize ourselves in the connection between us. Connection: each one tries to act for the good of the other, and see whose attributes complement each other beautifully.